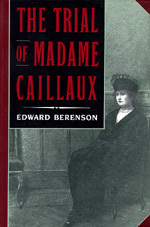 Edward Berenson recounts the trial of Henriette Caillaux, the wife of a powerful French cabinet minister, who murdered her husband's enemy Le Figaro editor Gaston Calmette, in March 1914, on the eve of World War I. In analyzing this momentous event, Berenson draws a fascinating portrait of Belle Epoque politics and culture. Edward Berenson is Professor of History at the University of California, Los Angeles, and the author of Populist Religion and Left-Wing Politics in France, 1830-1852 (1984).